The WV Legislature is back in session as of Wednesday, January 9th. This update is designed to prepare and educate you, and includes a special section about our DEI activities! Supports maintaining West Virginia’s water standards to reflect EPA recommended human health criteria. Supports strengthening disclosure requirements for the sources of political campaign expenditures, including dark money. Supports measures that encourage investment in renewable energy and energy efficiency in West Virginia’s homes, businesses, and industries. Medicaid is always a subject for discussion. Matching funds must come from the state, though most of the funds are federal. One of the League’s priorities for this session is maintaining Medicaid expansion that provides thousands of West Virginia’s citizens with health care. Medicaid is the health insurance for more than a third of West Virginians. Many recipients work at low-paying jobs. Others are too old, too ill or too young to be employed. There is frequent discussion nationally of adding work requirements to eligibility criteria. This has been tried, proved to be unworkable, and led to many people being cut from Medicaid. For example, Arkansas added work requirements with difficult eligibility rules. After the first three months, more than 4,000 recipients lost coverage due to inability to meet work requirements or rules. Medicaid expansion research has shown success in improving health. In the 2018 election, three state’s voters agreed to expand Medicaid, despite opposition from their state legislatures. Maine’s new governor has pledged to expand Medicaid, after resistance from the outgoing governor to a vote for expansion in 2016. LWVWV will oppose legislation that reduces access to health care. In past years several bills were introduced to allow parents more say in vaccinating their children, despite laws in effect for many years that have required specific vaccinations for entry to school. In other states, such relaxation of laws resulted in increased cases of such common children’s illnesses as measles, which can have serious effects on babies, pregnant women and other vulnerable groups. LWVWV would support maintaining high levels of vaccinations in order to prevent serious and widespread diseases. Constant efforts to repeal the Affordable Care Act at the federal level are of concern. After large increases in health insurance coverage under ACA, West Virginia’s uninsured rate increased from 5.3% to 6.3% from 2016 to 2017, according to the WV Center on Budget and Policy. Repeal would reduce health care to almost 800,000 West Virginians with pre-existing conditions. The League of Women Voters believes in basic affordable health care that includes prevention of disease, primary care, acute care, long-term care and mental health care. All of this is available to some extent in ACA. If you would like to receive the Fact Sheets on each of these issues, you may contact Helen Gibbins, gibbins@frontier.com. Last year a proposal to timber in state parks lost because many organizations and individuals worked to defeat the proposal. The “SOSParks” group continues to work this year to encourage the state to appropriate funds for the considerable infrastructure needs in the state parks. A recent state parks report listed several possible sources of funds. SOSParks is reviewing the proposals and will make decisions and proposals for the funding. Here is some information from the report prepared by SOSParks. “-Even with last year’s $60 million bond sale, the parks still need more money. The total maintenance backlog is likely $100 million or slightly higher, so $40+ millions in additional funds are needed. “-Entry fees are still recommended in the report, despite the possible drawbacks of reduced access, overhead costs etc. “-On the good side, the report did recommend that the legislature appropriate more money for parks. An additional excise tax is also an option. “-Unfortunately, it also recommends that legislation be introduced to allow the DNR to sell park property and resources if needed to raise funds. This could indirectly reintroduce the idea of logging. “-New internet sales tax could bring in $21 million this year, and $42 million per year thereafter, according to a WV official. Federal estimates are higher. Even a small percentage of that revenue, dedicated to parks on an annual basis, would provide a lot of extra money. The LWVWV will continue to be a part of SOSParks to ensure that WV’s wonderful parks will not deteriorate. Be ready for some Action Alerts. -strongly urge Congress to increase the death benefit under Social Security from $255 to $1000 (has not increased since 1935) as requested by House Concurrent Resolution 73 sponsored by Pyles. -Convince the West Virginia Legislature to increase the homestead exemption for senior citizens, 65 years of age and older, from $20,000 to $30,000 assessed value (has not been increased since 1985). -Convince the West Virginia Legislature to exclude Social Security income from the State income tax (House Bill 2417, sponsored by Pyles) and urge Congress to do so at the Federal level. -Urge the West Virginia Legislature to pass House Bill 2848, the Livable Home Tax Credit (co-sponsored by Pyles) to provide a tax credit to elderly and disabled persons who need to modify their homes. 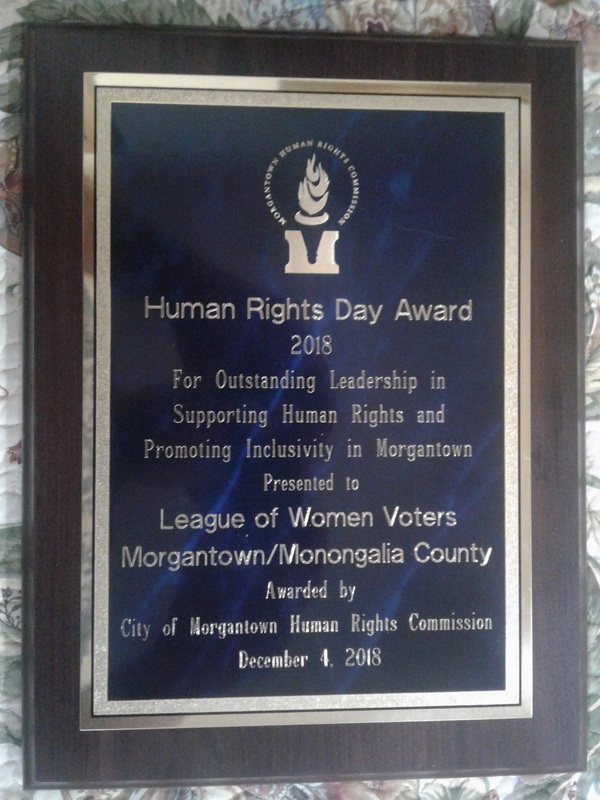 Congratulations to the League on receiving the Commission’s 2018 Human Rights Day Award for a local organization. The award was presented at the December 18th meeting of the Morgantown City Council, where Delegate Barbara Evans Fleischauer received the award for an individual. The League is a member organization of CCSJ. 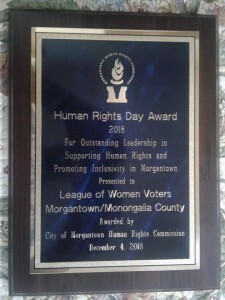 We are sincerely honored to receive this outstanding award from the Morgantown Human Rights Commission. The League has a long-standing position that all levels of government have the responsibility to provide equality of opportunity for education, employment and housing for all persons in the United States regardless of their race, color, gender, religion, national origin, age, sexual orientation or disability. In 1974, at the National League Convention, the League opened up membership to men. According to the New York Times, President Lucy Wilson Benson of the National League said, “If we’re ready for the ERA, then we darn well ought to be ready for men.” Because of this I had the opportunity to serve 4 years as President of the Morgantown-Monongalia League. Currently, I am the President of the West Virginia State League. When several of us attended the most recent National Convention, a motion passed with overwhelming support that the Equal Rights Amendment be ratified and that it becomes a U.S. Constitutional Amendment. Every hand went up in support! Obviously, I am very proud of our League for receiving this award, and all the volunteers of the League who have worked so hard over all these years to Defend Democracy and the rights of all humans. The League takes action on positions that we have reached a consensus on through intensive studies. Most recently we asked people to vote “No” on Amendment 1. We have educated the public about the Affordable Care Act, had forums about county-wide planning, local and county government. We have worked successfully with City Planning on zoning code revisions relating to the extractive industry to protect the livability of our town, and educated the public on Green Jobs and Renewable Energy. We are a partner with Solar United. You can learn more about our history and what we do at morgantown.lwvwv.org. We do not build barriers to becoming a member. If you live in the United States, and are not a citizen, you can become a voting member. If you are a student, and 16 years or older you can join our local League at low cost! We were happy to learn that the Human Rights Commission is in the process of drafting a Diversity, Equity and Inclusion Plan – DEI. You will be happy to learn that the League’s membership program is now focusing on DEI, which will involve creating an action plan. Maybe we will be comparing notes! Once again, we graciously thank-you for tonight’s award to the League! Action Plan: The action plan will include a set of designed by LWVEF and additional goals designed by the state that will be customized to best reflect each state’s DEI needs. All goals will have corresponding inputs and measured outcomes that the states will track and report on. Agreement to meet with their Shur Fellow at least once a month. Agreement to participate in LWVEF-led webinars for all Shur Fellows and participating states once every three months. Agreement to share successes and challenges to enable other Leagues to understand what is needed to achieve DEI goals. If you are interested in serving as the representative for West Virginia please contact President Jonathan Rosenbaum. The League sent a message Congress supporting the Federal Election Administration Act of 2016 to replace the Federal Election Commission (FEC) with a more comprehensive agency. The agency would work as a bipartisan watchdog to restore fairness, transparency, and integrity to the electoral process. The League signed a petition to President Obama to bring Affordable Care Act into compliance with National Voting Rights Act. This asks him to comply with federal law by making voter registration available through the federal health insurance exchanges under the Affordable Care Act. The League signed on to a letter prepared by the WV Rivers Coalition to the WVDEP on suggestions for its Triennial Review of Water Quality Standards. We supported Category A Drinking Water protection for all of the streams of our state unless there has been a variance given. Comments were also given on changing our methods for testing for bacteria, the best method for predicting acute toxicity of certain metals, adopting standards for aquatic life criteria for five organic chemicals, and determining the best measurement of flow vis-a-vis the pollutants distributed into the waters. To read the comments, contact Helen Gibbins, gibbins@frontier.com . After the June floods in WV, West Virginians were reminded that there was a flood protection plan released in 2004. If it had been adopted, some of the deaths and other severe problems left in the aftermath of the floods could have been prevented. The Plan included some suggestions such as better management of construction in flood plains and better-enforced building codes; improved flood warning systems; new regulations on timbering to prevent runoff pollution; guidelines for the design of stream crossings, access roads and culverts; more rigorous stormwater flow management; new rules for flood insurance; more public education efforts; and better regulation of non-coal dams. As to better regulation of timbering, we should remember that the 2016 budget cut 37 forestry employees, thus lessening the ability of the state to enforce the Logging Sediment Control Act. Even without legislation the state has improved the distribution of stream gauges that provide real-time data for flood warnings. But many officials believe this system needs further improvement. Also flood plain management has improved on the local level because counties have adopted flood plain ordinances, but enforcing the ordinances varies throughout the state. The Flood Plain Study also asked for the establishment of a Flood Prevention Task Force to coordinate state efforts on flood prevention. That suggestion also was not passed by the legislature. Flooding in WV is a huge expense to our citizens both in lives lost and destruction of homes, infrastructure, and places of work. Government also bears high expenses in trying to ameliorate the damages from flooding. West Virginia is a state with much unplanned development, natural resource extraction, and a topography that contribute to damages from flooding. Re- looking at the Flood Protection Plan and implementing its suggestions should be a priority of the legislature and our citizens. “The Clean Power Plan is the Obama administration’s policy to cut carbon dioxide emissions from coal-fired electric power plants by 32 percent below 2005 levels by 2030. Under the plan, which was critical to the Paris climate agreement slated to be signed this month, the Environmental Protection Agency plans to regulate power plant emissions under the Clean Air Act. Each state has its own emissions reductions goal to meet under the plan. “Nearly half of all the states want to stop the Clean Power Plan because they believe it’s an illegal attempt to ‘reorganize the nation’s energy grid’ and an attack on the coal industry that will lead to higher electricity costs, even though the EPA says the plan will lead to lower electric power bills for homeowners. The USEPA finalized the first-ever national standards to cut climate-harming methane pollution from the oil and gas industry. These safeguards, which apply to new oil and gas infrastructure, will help protect our climate and communities around the country from dangerous methane pollution from future oil and gas development. The WV Attorney General and AGs from some other states are challenging the rules on methane. The LWVWV participated in three meetings this summer as part of an advisory panel making recommendations on implementation of the automatic voter registration (AVR) program scheduled to go into effect in 2018 under the provisions of HB 4013, (better known as Voter ID bill) passed by the legislature this year. The Secretary of State’s office is responsible for submitting the rule to implement the AVR provision for legislative approval. The advisory panel included county clerks, DMV, LWVWV, CAG (Citizen action Group), and various other interested groups and also was advised by Tova Wang of the Center for Secure and Modern Elections. If local Leagues get inquiries, note that West Virginia’s Voter ID law does not go into effect until 2018. It provides a long list of acceptable forms of identification. There will be an opportunity for local Leagues to do education in their communities on this change in the 2018 elections. When implemented, AVR will provide that whenever someone has a transaction at the DMV they will automatically be registered to vote unless they affirmatively decline to register. Most of the information necessary for voter registration is already collected and stored by DMV, so only minimal extra information is required to add unregistered eligible voters to the rolls. The Clean Elections Coalition also met this summer to consider the direction in which its efforts should be focused. The priorities were securing ongoing funding for the public financing program for candidates for the Supreme Court of Appeals, improving regulation of campaign financing disclosure, and better enforcement of disclosure laws. 37,284 people enrolled in private plans through West Virginia’s exchange during the 2016 open enrollment period. More than 12,600 were new enrollees, while the rest already had coverage through the West Virginia exchange and either renewed it for 2016 or switched to a different exchange plan. 86 percent of the 2016 enrollees are receiving premium subsidies to offset the cost of their coverage. The League’s Voter’s Guide will be available from local Leagues, some newspapers, and online at www.lwvwv.org. Look for it by October 17th. The state League collects data on statewide offices (governor, etc.) and local Leagues collect the information from their local representatives (delegates, mayors, etc.) If there is no local information for your area, that is because there is no local League in your part of the state. This will certainly be an exciting year for elections! Every year the League chooses Legislative priorities to help focus on issues which may see action in the Legislature. Explanations and further information for each priority statement are found below. The LWVWV strongly opposes voter ID laws and other measures that unduly restrict eligible voters’ ability to exercise their right to vote. The LWVWV supports strong rules that will protect all West Virginians from chemical spills and other hazards to our drinking water sources. The LWVWV supports measures that would assure adequate, predictable and sustainable funding for West Virginia libraries. The LWVWV supports increasing taxes on tobacco products in order to improve the health of West Virginians. Advocates of Voter ID laws say they are trying to prevent fraud in voting. The fact is that cases of ineligible people attempting to vote or actually voting are extremely rare. Most cases of election irregularities involve corrupt officials tampering with vote counts or violations of campaign finance laws. What Voter ID laws do is disenfranchise people who are eligible to vote but lack the necessary documents to obtain the required form of identification. Among them are older people whose births were not properly registered or whose records are missing, poor people who cannot afford the fees to obtain needed documents, non-drivers who lack drivers’ licenses, and people who simply are discouraged by the inconvenience of getting the necessary documents. It’s not hard to see that the disenfranchised are disproportionately urban (non-drivers), poor, and elderly. Given the dismal turnout in the most recent general election, we should be encouraging more eligible people to register and vote, not making it harder for them to exercise their right as a citizen. Last January a chemical leak into the Elk River ended up polluting the drinking water of nearly 300,000 West Virginians. The health of many of those living in the area served by the affected water company was harmed. Schools and many businesses closed during the event. People had to obtain potable water from jugs and other sources. The West Virginia legislature “stepped up to the plate” to pass SB 373 which strengthened the protections of West Virginia’s drinking water supplies. The League of Women Voters of West Virginia opposes any effort to weaken SB 373. A recent statement by the WV Department of Environmental Protection says that of the 50,000 above-ground storage tanks registered with the state, 1,100 were marked by inspectors as “not fit for service.” Officials remain in the process of determining whether any of those tanks are located near water sources for communities or contain toxic chemicals which could affect nearby communities. Lawmakers have indicated that they may revisit the storage tank requirements which have been criticized by businesses as too expensive. To ensure clean, safe water for everyone as well as a vital economy in West Virginia we must keep SB 373’s protections and their implementation strong. Public libraries are a major educational and community resource. West Virginia’s libraries are seventh in the nation in state funding, but only 49th in local funding for operations. The West Virginia League of Women Voters will support legislation providing more adequate, sustainable funding from public sources in order to fulfill the goals of our public libraries. The following are the goals, and some bills are expected o be introduced. The major goal is to maintain current Grants In Aid to libraries at the current $5.09 per capita. Bills are expected to establish a vehicle for a Library Facilities Improvement Fund, which would receive funding at a later date, and another to allow counties to add one penny per $100 assessed value to property taxes, to be dedicated to libraries. Allowing a simple majority for approval of all excess levies, not just education levies, would be very helpful to libraries. Children would also benefit from having professional staff in their school libraries. West Virginia has the second highest prevalence of current smoking among adults in the nation in 2011 according to the WV Bureau for Behavioral Health . During the years 2006-2010, the estimated annual direct health care costs caused by deaths and illnesses from smoking were $709,000,000. With regard to tobacco use among youth, in West Virginia we have seen a recent decline in use. Evidence indicates that higher cigarette taxes/higher price leads to decrease in tobacco use, particularly among youth who have less expendable income and less access. According to the report “Tobacco is Killing (and Costing) Us,” report published collaboratively by the WV Division of Tobacco Prevention and the WV Health Statistics Center, while there have been successes in reducing smoking among WV youth, our state shows no declines in smoking among WV adults, and has one of the highest rates of cigarette smoking in the nation. There needs to be a collaborated effort in education, prevention, cessation strategies, and policy initiatives that support one another. Towards this end, League supports all efforts to increase state tobacco taxes in West Virginia as a means to improving health overall for West Virginians. West Virginians Deserve Safe Drinking Water. We need your help in observing the one-year anniversary of the careless contamination of the drinking water of more than 300,000 West Virginians. We need to make sure more is done to protect water across the state. With continued citizen pressure, we assure the progress we’ve made in 2014 toward cleaner, safer water continues. Together, we can make certain all provisions of the Above Ground Storage Tank Bill are maintained during the 2015 WV Legislative Session. Contact league member Helen Gibbins gibbins@frontier.com for more information. 1. We want all of our rivers and streams protected for current and future drinking water use. Defend existing application of Category A protections, the water quality standard for drinking water use, for rivers and streams across the state. Reclassify the Kanawha River as Category A to provide an option for a secondary intake. Continue to require coal mining permits meet water quality standards to protect drinking water supplies. 2. We want strong source water protection plans. Appropriate $12.2M for source water protection planning. Enforce the requirement that the public be included in the planning process. 3. We want strong regulation of aboveground storage tanks. Reject attempts to exclude tanks that pose risk. Ensure tank owners will be financially responsible for potential contamination events through adequate bonding requirements. 4. We want studies and recommendations to protect our water supplies to be further considered. Authorize funding for the continuation of the WV Public Water System Supply Study Commission. Ensure the Commission completes the Chemical Safety Board Recommendation Roadmap by June 2015.
o Appropriate $12.2M for the development of source water protection plans. o Consider legislation for income tax credits for landowners for source water protection entitled the “West Virginia Water Protection Incentive Act”. Since the League is relatively small, we join together with certain other organizations in order to accomplish our goals. The organizations we choose to join are chosen to have similar policies and issues to ours. Some of them are below with their websites included for more information. The League is a part of this action team which meets weekly during the legislative session. It supports the advancement of family-friendly public policy and works to mobilize support for issues that improve the lives of children in West Virginia. You can sign up for action alerts on pending issues affecting children here: http://salsa4.salsalabs.com/o/50981/p/salsa/web/common/public/content?content_item_KEY=12075 . West Virginia Environmental Council (WVEC) http://wvecouncil.org/. The mission of the West Virginia Environmental Council is to facilitate communication and cooperation among citizens in promoting environmental protection in West Virginia, to assist in organizing grass roots groups, to facilitate interaction among established environmental organizations, and to correspond with all appropriate local, state, and federal agencies involved in the management of West Virginia’s environment. League member Conni Lewis, connigl@aol.com will be their new coordinator of lobbyists. West Virginia Citizen Action Group (WV-CAG) has, since 1974, advocated for better public policy, rights of individuals, a clean environment and a stronger democratic process. Their main goal is to increase the voice of the average citizen in public affairs – to speak out in behalf of the consumer, to speak out in defense of a cleaner environment, and to speak out against governmental corruption. Other issues include health care reform, taxation reform, ethics, election reform and women’s issues. OVEC is a nationally recognized grassroots organization dedicated to the improvement and preservation of the environment through education, grassroots organizing and coalition building, leadership development and media outreach. Their work encompasses much of West Virginia. Solid Waste Management Board’s website http://www.state.wv.us/swmb/ is a good place to keep up to date on the progress of recycling and solid waste legislation. Click on Solid Waste Associated Legislative Activity. Among their other purposes, they plan for the proper management of solid waste on both the state and local levels. They are also involved in the development of recycling infrastructure statewide. This is accomplished through the distribution of grant funds to the local solid waste authority’s, public awareness programs, and assisting individuals, businesses and government units in finding markets for recyclable materials. This is a group of concerned West Virginia residents, businesses and organizations who have come together to promote energy efficiency among residential, commercial, and industrial customers in our state. Library funding in Kanawha County and yours – consensus due Oct. 15. Candidate Questionnaire coming soon in the WV Voter. Women’s Equality Day anniversary celebrated. Conni Lewis reports on National Convention. New National League consensus on agriculture is announced. Turning Point Suffragist Memorial seeks donations. Background: Three times the Kanawha County Board of Education sued to have the Kanawha Public Library monies that were appropriated by the legislature returned to the Board. The Supreme Court ruled in the Board’s favor this last time (2013). The decision resulted in a loss of about 40% of the library’s total operating budget. Several other counties in West Virginia which had similar legislative mandates, made the decision to continue funding their libraries. Kanawha County did not. The Kanawha Library system could not effectively function without this money. The County Board of Education placed a levy on the ballot for the May 2014 primary, but they included added a large amount of dollars for improvements in the school system. This levy failed. The Board of Ed has agreed to put the issue to the public once again in the November 4 general election, this time with a much lower dollar amount, and with the total going to operate the library system. HOW IS YOUR LOCAL LIBRARY FUNDED? The WV League of Women Voters is finishing up its study on Public Library Financing in WV, and you can participate. You should have received the league’s study material, either via email or through your local league. (To have it emailed to you, contact NnovakWv@gmail.com.) Local leagues in Huntington, Jefferson County, Morgantown and Wood County will hold meetings this month to discuss the background material and answer the questions together. Members-at-large may participate by filling out the questionnaire and returning it by October 15 to Carolyn Watson, 131 Starlight Lane, Harpers Ferry, WV 25425. Please clearly identify yourself in order to be counted as a league member. All statewide candidates have been asked questions by the league, and their answers will appear in the WV Voter, your state league newsletter, and will be posted to the WV League website about October 15. The candidates covered will be the two major parties, Republicans and Democrats, and also five additional parties appearing on the state ballot. The US Senate and House races will include the Libertarian, Independent, Constitution and Mountain parties. The WV Senate and House of Delegates races will include the American Freedom Party, Constitution Party, Independent, Libertarian, Mountain Party. However, not every party will be represented in every county. You may see the complete list on the Secretary of State’s website, http://apps.sos.wv.gov/elections/candidate-search/, with local races found at your County Clerk’s office. There are no state Constitutional Officers or Supreme Court races on the ballot in 2014. Recently the League of Women Voters marked Women’s Equality Day, the 94th anniversary of the constitutional amendment that granted women the right to vote. The Huntington League celebrated the occasion with its work to engage and empower all voters. League members are committed to making sure voters have the information they need to participate in elections and ensure their votes count. The Huntington League cooperated with the Herald-Dispatch to produce an election guide; they are sponsoring candidates meetings, and they register citizens to vote. Other leagues in West Virginia are similarly active at for the November election. West Virginia League member Conni Lewis (Charleston) attended the Convention in Dallas in June. She served as a presenter for caucus called “Don’t Drink the Water: Protect Your Water from Chemical Spills” sponsored by an Illinois league. She drew from her experiences as an affected resident during the January 2014 spill from a chemical storage tank into the Elk River. Three hundred thousand residents of Charleston and nine counties were affected. The league caucus presented information about the spill and how we can reduce the risk of a similar spill. The League believes that government should provide financial support for agriculture that includes disaster assistance, crop insurance, need-based loans and incentives to adopt best management practices. Support should be extended to new production methods, such as organic, hydroponic, and urban practices, and to farms that supply local and regional markets. Subsidized crop yield insurance should be linked to implementation of best management practices with the subsidy denied for marginal or environmentally sensitive land. Government should limit the amount of the premium subsidy received by larger farms. The League supports policies that increase competition in agricultural markets. Antitrust laws should be enforced to ensure competitive agricultural markets. Alternative marketing systems such as regional hub markets, farmers’ markets and farmer cooperatives should be promoted. Clean air and water regulations should apply to all animal and aquaculture production and processing facilities. For further information, please see http://www.lwv.org/content/lwvus-position-federal-agriculture-policies. A league in Virginia is spearheading an effort to build a memorial to the women who sacrificed so much in the days leading to the passage of the 19th Amendment. In partnership with the association trying to raise funds to build this memorial, the league is are trying to raise awareness among members all over the country; the imprisoned women were from all over the country as well. They are also collecting suffrage effort stories from the states to be made available at the memorial. Many of the supporters had great-grandmothers in the forefront of the fight. If you are interested in this project, please see the website www.suffragistmemorial.org. The WV League board of directors will meet in Bridgeport on November 8, 2014. Any League member may attend. If interested, please contact NnovakWv@gmail.com. Birthplace of Rivers National Monument is proposed. The League supports affordable health care. The League participates in Constitution Day. The September state board meeting is open to members. The proposed Birthplace of Rivers National Monument is a citizen initiative designed to protect a part of the southern Monongahela National Forest that includes the headwaters and tributaries of the Gauley, Greenbrier, Elk, Williams, Cranberry, and Cherry Rivers. This section of the Allegheny Mountains possesses some of the most iconic natural features and best outdoor recreation in the eastern United States. It features dense forests of red spruce, trout streams and black bear habitat. In addition, Cranberry Glades hosts a unique series of tundra-like bogs which shelter migratory birds and rare plants. The League has often taken positions in favor of saving public lands for recreational and aesthetic purposes. We contacted our Members of Congress, asking their support for this National Monument, and we encourage other citizens to do so too. More information can be found at http://www.birthplaceofrivers.org/ . As everyone knows, the West Virginia health insurance exchanges are up and running and are proving extremely popular. The national league‘s 1993 position on health care states in part “a basic level of quality health care at an affordable cost should be available to all US residents.” The remainder of the lengthy position may be found in the booklet Impact on Issues by going to: http://www.lwv.org/content/impact-issues and downloading the Social Policy section IoI2012_SocPol.pdf. Several local leagues in the state, including Morgantown and Wood County have held public meetings to help the public get ready for this important and complex new program. Constitution Day was established by Congress in 2004 after being proposed by our own Senator Robert C. Byrd. All K-12 schools as well as all colleges and universities receiving federal funds must have some program or activity that features the United States Constitution. The West Virginia League of Women Voters was one of the sponsors of this year’s celebration on September 17 at our state capitol in Charleston. The League has played an active part in this program for the last three years; in addition, the Huntington league has also participated in Constitution Day activities. Here’s some news from the WV Women’s Commission from their recent newsletter. Employment – In 2010, 50% of women in West Virginia were in the labor force compared with 59% of men On average, women who work full-time annually earn $29,000 compared to $42,000 for men. Economic Security – West Virginia women are more likely than men to live at or below the federal poverty line. The League’s state board of directors will meet in Parkersburg on November 16, 2013. Any League member may attend. If interested, please contact Nancy Novak for more details. For additional information about events happening in the WV or National Leagues, please log on to www.lwvwv.org.or www.lwf.org. The League has filed a petition on surface mining. Another Supreme Court ruling you may not have heard of. The League joined the Citizens Action for Real Enforcement Campaign (C.A.R.E. ), a coalition of state and federal organizations that is demanding accountability for West Virginia’s enforcement of the Surface Mining and Reclamation Act (SMCRA). On June 24 the group filed a formal administrative law petition with the federal Office of Surface Mining Reclamation and Enforcement (OSMRE) alleging widespread problems with enforcement of the Surface Mine Control and Reclamation Act. and the WV’s Department of Environmental Protection’s (WVDEP) demanding federal intervention. The petition was filed under a provision that allows citizens to ask the federal OSMRE to take over a state agency if they believe the agency is failing to enforce the law. The filing of this petition triggers an obligation on the part of OSMRE to investigate the citizens’ claims and, if they are deemed valid, to order changes in the state program or assume enforcement itself. Understaffing and underpaid employees resulting in inadequate inspections. Grossly inadequate penalties for infractions of the law. Deficient use of accurate science relating to flooding and pollution, resulting in permits that do not protect communities and our waters. Resisting the monitoring of selenium and conductivity in the effluents from mine sites resulting in impaired streams. The League is joining other groups to submit comments to the Department of Environmental Protection’s (WVDEP) on its Triennial Review of water quality standards. The other groups include the WV Rivers Coalition, WV Environmental Council, WV Highlands Conservancy, Appalachian Mountain Advocates, WV Chapter of the Sierra Club, Ohio Valley Environmental Council. The need for nutrient criteria for streams to ensure aquatic health. Opposition to weakened standards for aluminum. Support for the establishment of a Total Dissolved Solids standard. Support for an aquatic life criterion for water conductivity that is consistent with peer-reviewed scientific analysis that high conductivity harms aquatic life.